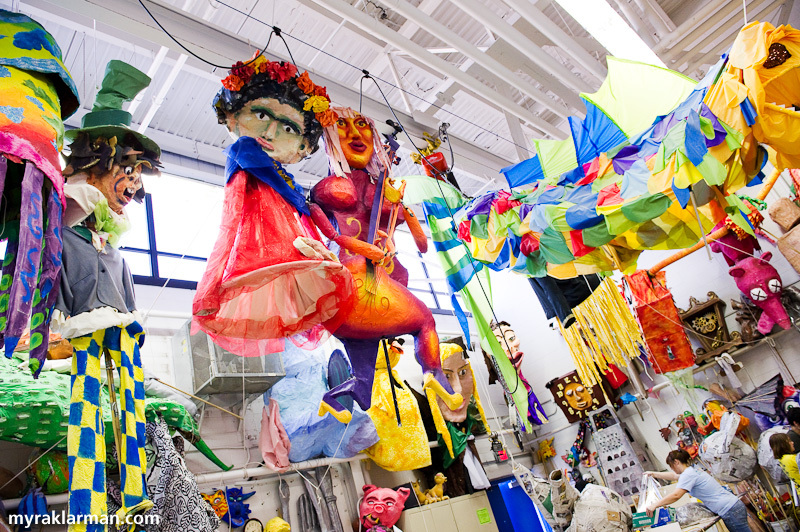 Puppets of FestiFools past inspire this year’s creators. 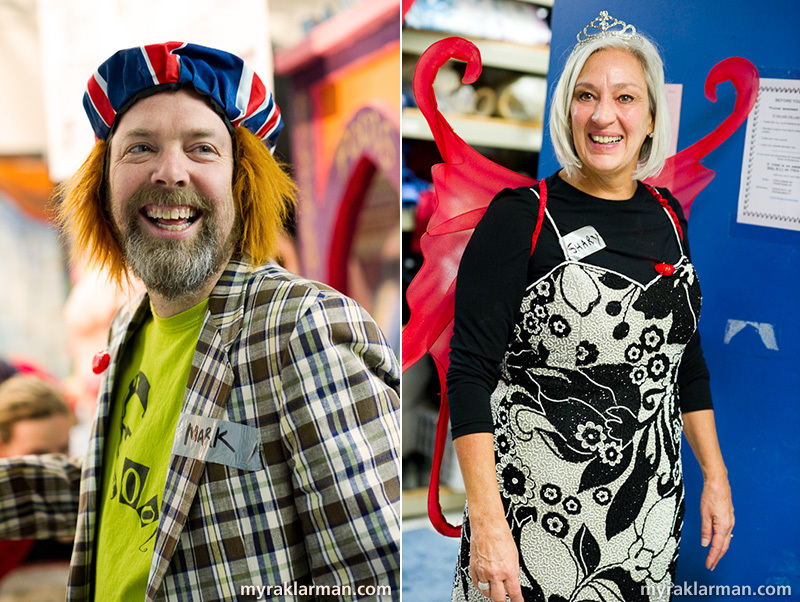 FestiFools heartily welcomes volunteers for the day of the event — puppet wranglers, crowd control, merry-makers, and “roadies.” To join this circus-for-a-day, check out FestiFools: Volunteer at the Event and/or email startproject@umich.edu. 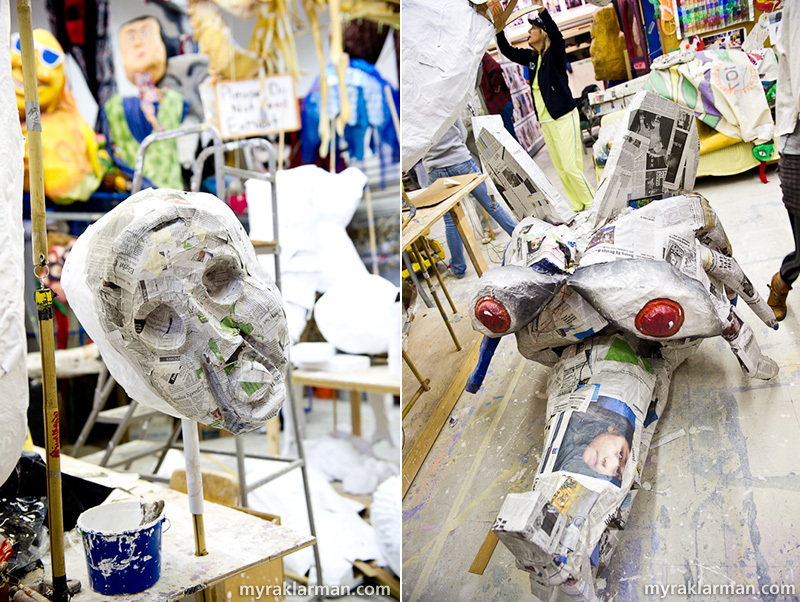 After the dancing-in-the-streets-with-giant-puppets-like-there's-no-tomorrow street party, we’re gonna be mighty hungry. So immediately following FestiFools, we’re hightailing it straight to FestiFeast! Please join us at this family-friendly afterglow party in the Aut Bar courtyard (located directly across 4th Ave. from the Farmers’ Market in Kerrytown). April 1-11: Morgan & York donates to FestiFools — with your help! Morgan & York is donating 5% of total sales to FestiFools through April 11. But you gotta mention “FestiFools” to the cool person behind the counter or your purchase won’t count toward the total! Check out this page for the full details. According to a source working at the highest levels within the FestiFools organization, plans are already underway to extend the spirit of Foolishness well beyond the 60-minute street party itself. Apparently, it has something to do with hats. (My source offered no more than this cryptic non-explanation: “More like fez than fedora, but really not that much like fez.”) So all we can do is keep our eyes peeled on Sunday, and see how this story unfolds. 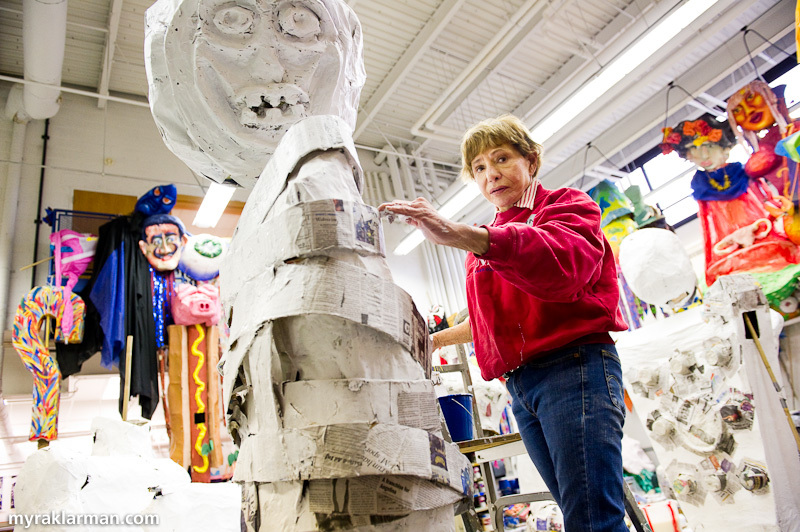 Community volunteer Joan French primes a puppet for its final layer of color. Community volunteers at work. 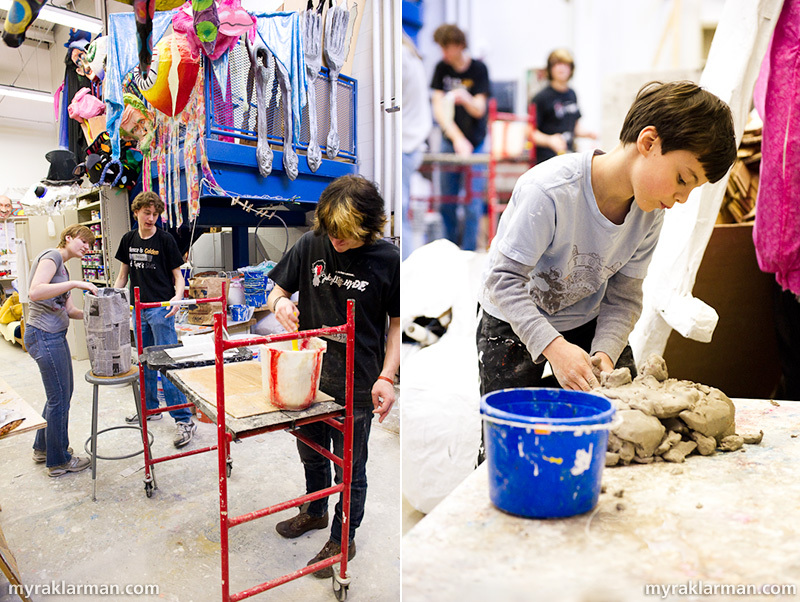 | Max sculpts a face out of clay (when it’s dry, it’ll serve as a mold for a papier-mâché mask). U-M student Mike Kelmenson fits right in. 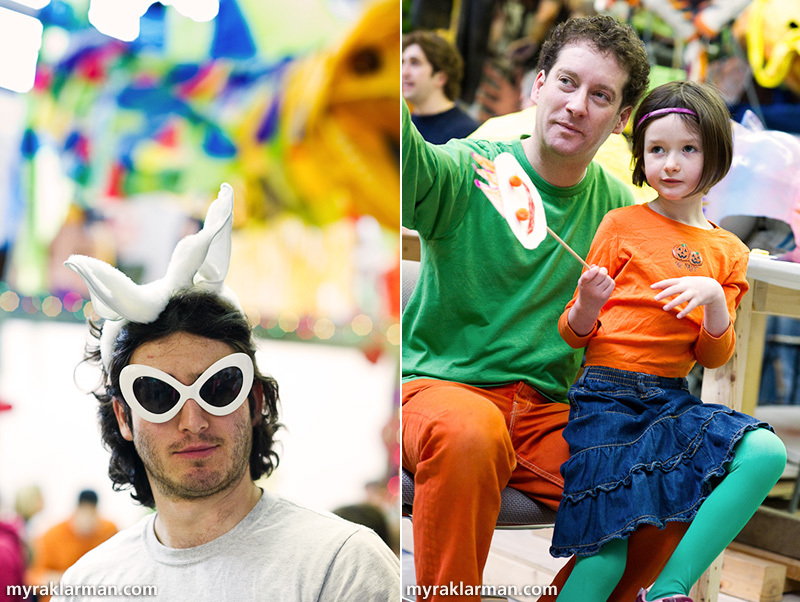 | U-M associate professor Nick Tobier enjoys a FestiFools open-house event with his daughter. Nick was instrumental in getting the first three FestiFools events off the ground. 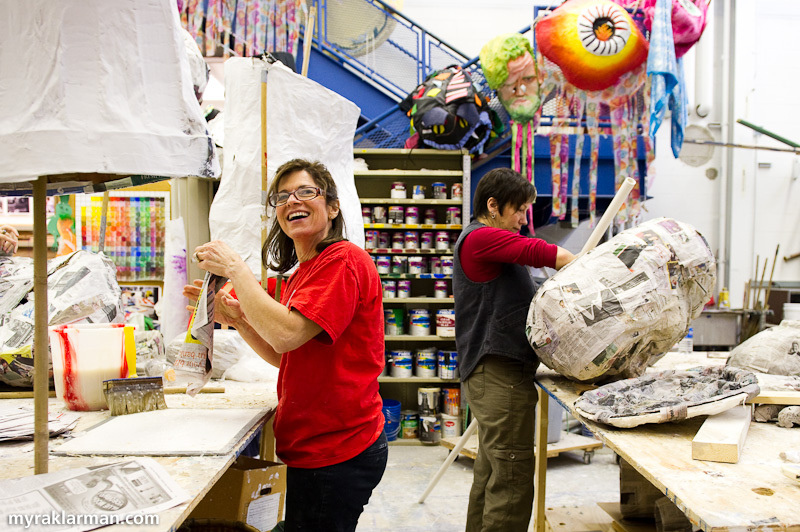 Ruth Marsh (FestiFools’ resident superhero) and Gretchen Adracie (of ArtSpoken) do papier-mâché. 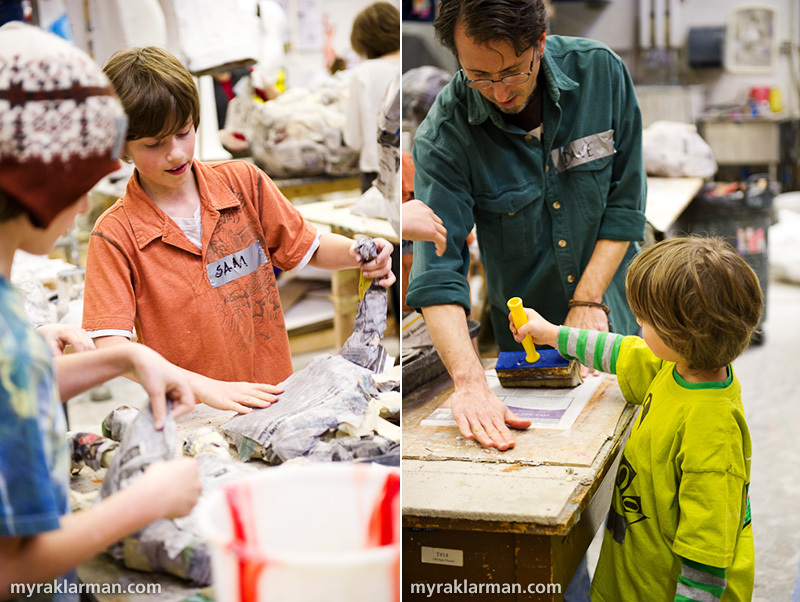 FestiFools steering committee member Dave Waterhouse does papier-mâché with his sons. FestiFools creative director Mark Tucker | Shary Brown (former executive director of the Ann Arbor Street Art Fair) joined the FestiFools creative team this year! Gloriously garish, gaudy and great! Look at all the work that goes into that! It looks like SO much fun, though! You have such a fabulous journalistic eye. I feel like I’m right in it!